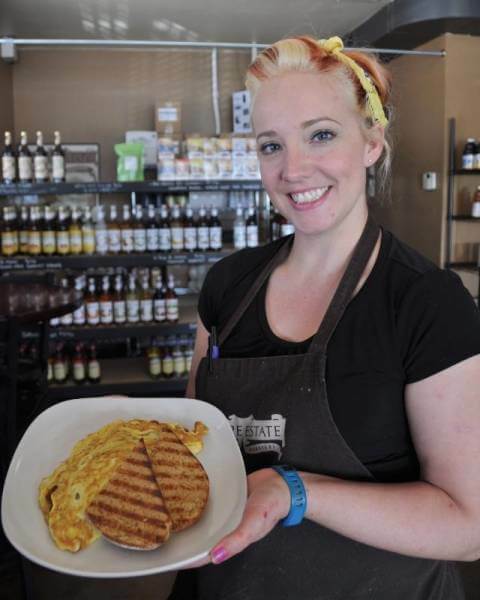 Stephanie grew up in Casper, Wyo., where she fell in love with baking and pastries. She went to cake decorating school but wanted to do more. After studying hospitality management in Wyoming and attending French pastry school in Chicago, she moved to the Colorado Front Range. She worked at a number of food related businesses, most recently Boonzaaijer’s Bakery, where she was lead baker and baking manager. “One day I came wandering into Colorado Coffee Merchants to buy some espresso and told them about my candy business and they suggested I bring in some samples,” she recalls. Store owner Eric Umenhofer had always wanted to serve food and quickly realized Stephanie might be the person to make it happen. Since then, local food critics have raved about the quality and freshness of Stephanie’s ever-changing rotation of made-to-order meals. Weekly themed menus include taco variations on Tuesdays, eggs Benedict on Wednesdays, and sausage and gravy on Fridays. Stephanie also keeps up with her sideline business, Steffi’s Bakery and Confections. You can see photos of her cakes and candies and find out how to place special orders by CLICKING HERE to visit her Facebook page.